North Dakota, whose tagline is “Be Legendary”, claims to rank number one in water quality, air quality, quality of life; and “shortest average commute time in the country”. Doug Burgum is the Governor, Lieutenant Governor Brent Sanford is Senate President, and Lawrence R. Klemin is Speaker of the House of Representatives. Burleigh is the second-most populous county in North Dakota and Brian Bitner is Chair of County Commission. 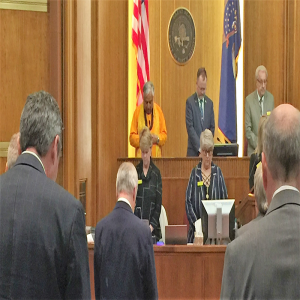 Details of the picture attached: Rajan Zed reading invocation in North Dakota State Senate. Standing next to him is Lieutenant Governor Brent Sanford.